For you, the athlete, you are who we serve. For You. If you're training towards something then you are an athlete! The world is changing, including the sports and races that we love. So why doesn't our approach to coaching change. Well that's what we wondered. So we did, and all will be revealed in good time. For you, the athlete, you are who we serve. We work in with your current training if you're already established in coaching and we guide you if you're just getting started. We want to make high quality coaching more accessible, more fun and more dynamic. Check out our services or get in touch to see how we can help you. Our team know what they're talking about and compliment each other in their approach. Chris is white water instructor with plenty of river racing experience and paddles the Waimakariri River more times than anyone else each year and Leigh has trained olympians and representatives for paddlers over a variety of disciplines. So whether you're a keen beginner and want to get up to speed in a hurry at an affordable price or you have experience and want to be the best with a paddle; we've got you covered. 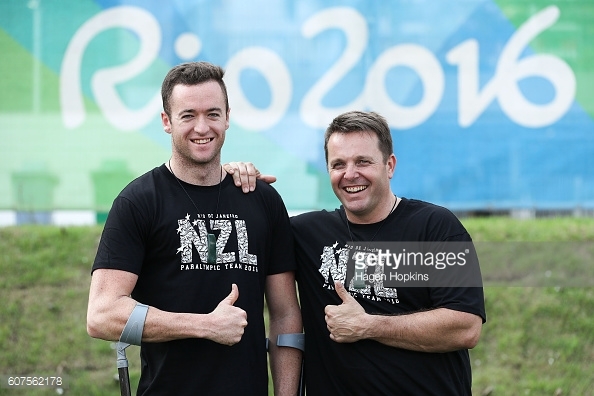 Scott Martlew + Leigh Barker at Rio Olympics 2016.